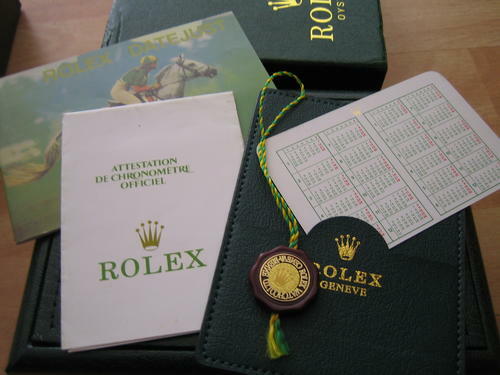 Rolex Box and Papers: Why Are They So Important? Why is it important to keep the box and papers that come with your Rolex? Buying a Rolex is much more than buying a watch; you are making an investment. When buying a pre-owned Rolex, you can usually get close to, if not more, than your original purchase price for your watch years later. Rolex’s are made to hold their value over time. To insure the most amount of money for your Rolex make sure you keep the box and papers it came with. Rolex boxes sell for hundreds of dollars on their own and are an integral part of owning a Rolex. The boxes also make great displays for jewelry stores who are interested in buying them. Even more important than the box are the papers. The papers include warranty papers that give your watch a one year warranty from Rolex with the model and serial number printed on it. This paper also guarantees the authenticity of your watch. Other papers include the instruction booklet and any other various paper that comes with a Rolex. Having a complete set of the Rolex watch itself, the box, and papers insure that you will receive the highest payment in the event you decide to sell it. A pre-owned watch that is part of a full set of all three components is very desirable and can only add value to your timepiece. The Rolex Turn-O-Graph was first produced in 1953. The main feature of this new watch was a rotating bezel to record elapsed time. Rolex called it a time-recording rim. Each minute division was shown by a small circle and each 10 minute interval was a number. The first Turn-O-Graph had pencil hands and was certified to dive up to 50 meters. Later on in the 1950’s the Turn-O-Graph, along with the Submariner, changed to the Mercedes hands. Also, the luminous part of the second hand was closer to the center of the watch. The first Turn-O-Graph had a very distinctive dial with the word Turn-O-Graph written extremely small under the Rolex signature. Also, the words Oyster and Perpetual were very far apart. A year later Turn-O-Graph was written in its normal size. There was also a honeycomb dial available on early models. A selling point for the Turn-O-Graph was its ability to record elapsed time while still costing much less than an expensive chronograph. It was also water resistant which most chronographs were not. The watch was first promoted by convincing people it would be a great watch for an international business traveler. It was out shined by the GMT Master in the 1960’s because of the GMT’s ability to show two time zones at the same time. In the early 1960’s the Turn-O-Graph ceased production which led way to the more popular GMT-Master. Rolex brought back the Turn-O-Graph back and it is available for sale today. Rolex’s continual efforts to improve its waterproof cases and shock-proofing systems ended with the creation of the Explorer model. By the 1950s Rolex’s rounded-back watches were seen as very reliable for their reputation of being tough and hard-wearing. Consequently, Rolex decided to carry these sturdy characteristics to the Explorer model for active and adventurous customers. From late 1952, prototypes of the first Explorers were given to mountaineering expeditions for field trials. At this early stage, the Explorer name was not displayed on the dial, and the watches were simply bubble-backs with white dials. The 3, 6, and 9 dial markers were marked with steel or brass arrowhead symbols. The dial hands were also leaf-shaped in a choice of steel or brass. To test the sturdiness of this new prototype, several members of Sir John Hunt’s May 1953 Everest expedition were issued with these watches. 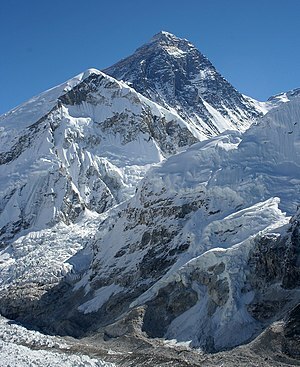 However, during the climb, it was later revealed that the climber who ascended mount Everest first actually wore a gold bubble-back given to him by the Swiss climber Raymond Lambert. Fortunately for Rolex’s publicity and marketing departments, climbers Hillary and Norgay both refused to reveal which of them had actually set foot on summit first. Both Smiths and Rolex reported the role of their watches in this great achievement, but the Rolex Explorer was forever linked with this conquest, especially because the climber who reached the summit first had previously worn many Rolex watches (in actuality, however, a Rolex was actually the second watch on top of the world). The first two Explorer models (6098 and 6150) were launched in the early 1950s. By mid-1953 the 6098 had become the 6298 model, and by late 1953 the 6150 had become the 6350 model. There was a transition period during which, these earlier model numbers (located on the inside of the watch case), were struck through, and below the new numbers were engraved. The A296 movement was installed in all these models. The 6298, 6150, and the 6350 had a recognizable Explorer-type “Quarter Arabic” dial with the 3, 6, and 9 marked with luminous numerals on a black ground. To promote this new model, ads described the new watch as a “reinforced Oyster”, and emphasized its tough construction, as well as reliability. In an attempt to soften the Explorer’s austere look and ensure a percentage of sales from the less adventurous customer, the Explorer’s dial became available with a textured finish. The first four Explorer models were followed by the 6610 model, which was fitted with the 1030 movement and Mercedes hands (initially the model had hands similar to those of the Submariner model). This was also the last Explorer to be fitted with a honeycomb dial. Shortly after this model came the 5504, fitted with a 1530 movement and a very attractive gloss black dial (these are marked Precision or Super Precision on the dial). By 1959 the 1016 model was introduced. This Explorer model was fitted with a matt black dial and a 1560 movement. By the 1970s, the 1570 calibre movement replaced the 1560, and later the watch came with a “hacking” feature. This allowed the movement to be stopped exactly on the beat of a second, top allow accurate time-setting. This feature, and the 1016’s successful fusion of the sports and dress watch look, has made the watch very attractive to collectors. Rolex became eager to capitalize on the success of the Explorer, especially since its popularity, and that of Rolex, boomed in the North American and Asian markets. The company began to use the same dial design on the Air-King 5500 model. These small Explorers were not popular with collectors until recently, especially because many people who were unfamiliar with the model assumed they were fakes. Current interest in Explorers has drastically increased their values. Rolex went on to produce many other variations of the Explorer, including 6298, 6299 models and event later on the Explorer II. 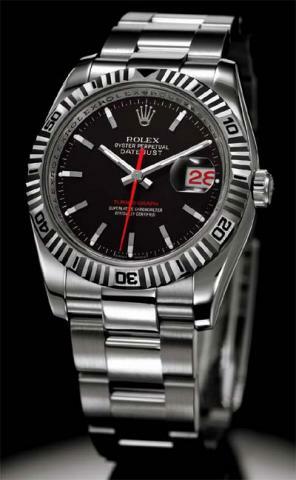 The Space-Dweller model is another variation of the Explorer. More recent designs were influenced by earlier designs, but each advancement came with some kind of new feature, such a new bezel design or hands. 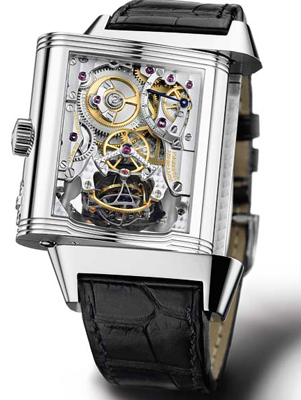 The Jaeger-LeCoultre Reverso is one of the most recognizable watches in the world. It was created to help protect watch faces during sporting events. The watch face is able to slide and turn over so that the back of the face is now the top. This protects the dial and crystal from scratches. The patent for this design was applied for in March 1931. Monsieur Cesar was working with gold dentures in England in the 1920’s. He went to India in 1930 to try and sell his product and heard polo players complaining that their watches kept getting scratched during games. Cesar had already come up with a design for the Reverso even before he heard these complaints and teamed up with Jacques-David LeCoultre and Edmond Jaeger to make the first one. The first Reverso came into production in 1931 and has been a symbol of beauty and innovation ever since. There was both a ladies and gents version of the watch. The Reverso was also produced for other companies like Cartier Favre-Lueba, Gruen, E. Gubelin, Hamilton, Patek Philippe and Turler. Today there are many versions of the Reverso including the Cassique, Duetto Duo, Duo, Grande Automatique, Grande Date, Grande GMT, Grande Taille, Grande Reserve, Lady, Platinum No. 2, and the Grande Reverso Email which has enamel dials from lithographs by Czech Art Nouveau printmaker Alfonse Mucha. Throughout the world in the 1950’s was a huge demand for diving watches. Scuba diving was becoming increasingly more popular and so too were it’s accompanying watches. Divers needed an accurate way of measuring how fast they were coming back to the surface and decompressing. DCI (decompression illness) was something they wanted to avoid at all costs. By the year 1954 there were three models of the Rolex Submariner were for sale. These first versions did not show the depth on the dial like they do today. In the Rolex catalog it stated that two of the three were waterproof up to 200 meters or 660 feet and the other was 100 meters or 330 feet. Also, these early models did not have the word “Submariner” written on the dial. Another lacking feature was the crown guards. The crown was exposed on these early models. The bezel was similar to today’s Submariner in that it is marked in 5 minute increments. The name Submariner was not used for the watch until the 1960’s. There were many other names being considered such as Frogman, Skin Diver, or Dive-O-Graph but in the end Submariner won the battle. Rolex kept making improvements to the Submariner. The luminous marking on the second hand was now towards the middle of the hand rather than at the end. Also the infamous Mercedes hands were invented where the hour hand seems to have a Mercedes symbol. In the mid 1950’s one minute markers were introduced on the bezel between the first 15 minutes on the countdown. Crown guards were also adopted around this time. The models before the crown guards were considered James Bond models because they appeared in the first four James Bond movies. 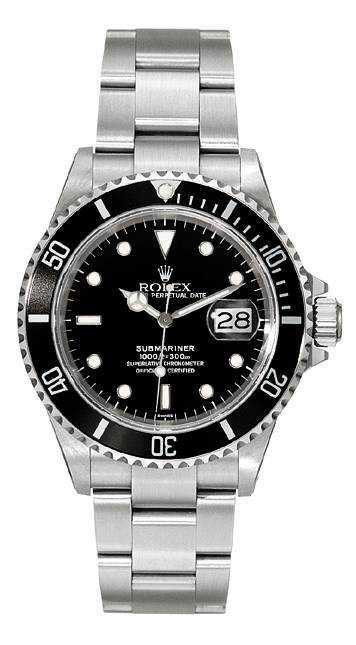 In 1966 Rolex added a date feature to the dial on the Submariner. Also, the word Submariner was written in red instead of white until 1974. There were many contracts for the Submariner to be sold to different armies around the world. These watches came came with a cloth strap rather than a metal one. By the 1980’s Rolex had installed a safety feature on the bezel. Previously the bezel could rotate in either direction, but Rolex realized it might rotate clockwise while underwater and make the diver climb to the surface faster. Now it can only rotate counter-clockwise. Also in the 1980’s Rolex upgraded to a scratch resistant sapphire crystal. Some of the weirdest watches ever produced were the Deep Sea Specials. These watches were enormous and created to show the waterproofing concept of screw-down crowns and gaskets. The Trieste model set a world record diving 3155 meters, which is over 10,000 feet. Years later it set another record going 11,000 meters or 35,798 feet. The Rolex Submariner stands as one of Rolex’s most popular watches. It’s classic design is one sought after buy more than just divers. It is a popular watch that only seems to find more demand with every year passed. Spotting the difference between a real and synthetic gemstone can be a difficult skill, but once learned, it will hopefully save you a lot of money and prevent you from getting scammed. First off, real gemstones are more prone to flaws, such as wear and tear, from the environment (whether it’s chipping from being hit against an object or scratching from brushing up against something rigid). Synthetic gemstones are created in laboratories and tend to look perfect. For instance, Moissanite is one of the most popular synthetic gemstones because it’s one of the closest substitutes to a diamond in appearance and feeling. Moissanite’s hardness and thermal conductivity make it very similar to a diamond, but not even close in value or authenticity! Always remember that natural gemstones tend to have flaws. Nobody or anything is perfect! Secondly, it is important to pay attention to the weight of the gemstone. Synthetic gemstones tend to weigh more than natural ones. If you held a synthetic gemstone and a real gemstone in each of your palms, you would be able to tell the difference between real and fake. Likewise, synthetic gemstones tend to sparkle more than natural ones. This is because natural stones have been through difficult weather conditions or other forms of nature. Lastly, the most notable difference is the price. Synthetic gemstones are moderately priced because they are made in a laboratory, and as a result, can be mass produced for relatively cheap costs. Natural gemstones, on the other hand, are difficult to come across, which is why they can be very expensive. If a deal ever seems too good to be true, then it probably is. Heed this advice and save your money! For more information on the jewelry industry insider knowledge, subscribe to this blog or visit our website, raymondleejewelers.net. A leading industry gemstone, sell diamond & sell jewelry information resource. Raymond Lee is the preferred resource when you need to educate yourself about gold, jewelry, watches or diamonds. Whether you intend to buy gold, buy jewelry, buy diamonds or buy watches an education can only increase your savings. Or maybe you’re looking to sell gold, sell jewelry, sell diamonds or sell watches… in that case an education is invaluable and will help you maximize your profit when dealing with savvy jewelry acquisition companies. Raymond Lee Jewelers will always pay you top dollar for your gold, diamonds, jewelry or luxury watches. GIA was established in 1931 and is considered the leading authority in gemology by many. The institute employs a staff of over 1,400 – many of which are scientists, certified diamond graders, and educators. Many of GIA’s centers are located in cities around the world such as New York, Florence, Mumbai, Tel Aviv, Hong Kong, Tokyo, and many others. GIA is credited with introducing the famous 4 C’s (Cut, Clarity, Color, and Carat weight) to the grading industry. It offers grading and inscription services, as well as educational services for consumers and professionals. EGL was established in 1974 and employs a staff of over 1,100 – many of which are scientists, certified diamond graders, and educators. EGL’s international locations are found in cities such as Paris, Hong Kong, London, Tel Aviv, among others, while the USA locations include cities such as New York, Los Angeles, Toronto, and Vancouver. The institute is credited with introducing specific grading techniques for diamonds weighing less than one carat and creating the “SI3” clarity rating. Generally, GIA certifications are considered more important than EGL, although EGL certifications do have some advantages. For instance, diamonds graded in a GIA laboratory are graded using strict standards. Each diamond is evaluated by at least four certified gemologists who are chosen at random to avoid bias. EGL’s standards are more lenient than those of GIA , and standards between EGL USA and EGL International vary slightly. EGL USA generally grades on a stricter scale than than of its counterpart. Generally, an EGL certified diamond will compare equally in quality to a GIA certified diamond that is graded two color grades and one clarity grade lower. Consequently, GIA certified diamonds are considered more valuable. The advantage of having an EGL certified diamond is that if an EGL certified diamond has the same quality and clarity to that of a GIA certified diamond, then the EGL diamond will be less expensive. This is important for people who consider the ratings on a certificate a high priority when purchasing a diamond. For more information on the jewelry industry insider knowledge, subscribe to this blog or visit our website, raymondleejewelers.net. A leading industry buy diamond and sell diamond information resource.